This Mediterranean Villa sits proudly on a beautifully landscaped corner in Cabrillo Estates. Step through etched double glass doors into a tiled open floor plan with high ceilings offering lots of natural light (sun & moon) through 21 skylights. Upon entering the Great Room a floor to ceiling wall of glass - windows and doors - opens to a very private protected and paved courtyard with koi pond. Look through the West windows to view glimpses of the Pacific Ocean. On a chilly evening you can light the gas log fireplace for ambiance and warmth. The home is single level, three bedrooms and three baths plus library/office with loft. Third bedroom has option to be a guest room, office or mother in law quarters with fireplace, kitchenette, bath and separate exterior entrance. Kitchen is "U" shaped with corian and wood counters with a large work or conversational island. There is an abundance of kitchen storage in custom cherry wood cabinets. Master bedroom with direct access to courtyard has a walk in closet and en suite with built in artisan cherry wood dresser and cabinetry. Park like outdoor spaces and paved patios complete your opportunity for enjoyment and entertainment of family and friends. There are two single car garages - one with a separate laundry alcove. 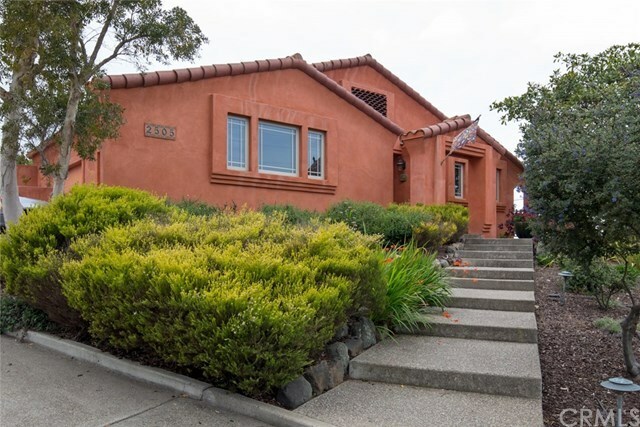 Located near Montana del Oro, golf, restaurants and shopping. Information not verified.